Three pressurized generators of 37.5MVA – 13.8kV are the most recent WEG supplying additions for the Mexilhão Gas Treatment Unit. This equipment is capable of generating enough energy for a city with a population of 550 thousand people. After supplying more than 120 thousand liters (26,396 gallons) of paint to the Mexilhão Platform at the Santos Basin, where the oil company discovered the largest Brazilian non associated natural gas reserve, three Generators will equip the Caraguatatuba Gas treatment unit (UTGCA), responsible for treating the gas derived from the Mexilhão extraction platform. l hold Turbine / Gearbox / Generator of each generating unit. After the assembly, they will be tested at the turbine manufacturer’s plant, in conditions of normal usage in the so called “String Test”, and transported back to Brazil, where they will be installed and tested at the Petrobrás plant. “These will be UTGCA’s main generators. The generator units will operate on a “2+1” system. In other words, two units operating and one on stand-by. Besides that, these generators will operate continuously pressurized in such a way to guarantee that no gases derived from the environment where the generators are located, get through to the internal parts, preventing from occurring an eventual ignition, says Fabio Vinicius Dematte from Weg Energy Business Center. UTGCA will be capable of handling 15 million cubic meters per day, and will be supplied with gas by Mexilhão, Merluza 2, Tambaú and Uruguá, all recent gas discoveries at the Santos Basin. These supplies evidence WEG’s experience and capability to serve the Oil and Gas industry with specific products for each application in the segment. Very demanding, the offshore market receives undivided attention: WEG counts on specific certifications and has provided during the past years important supplies for the sector. Besides motors and generators, products such as paint, transformers and panels are part of the equipment of petroleum extraction platforms and of platform support vessels. 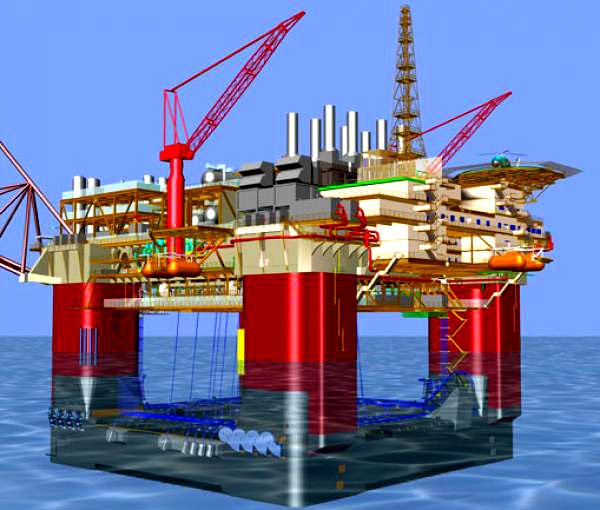 In addition to supplying generators, pump motors and compression modules - aside from 400 tons of paint for oil platforms P-51, 52, 53 and 54 - WEG equipment will now equip platform P-56. 100 thousand barrels of 16º API crude oil, 6 million cubic meters of natural gas and pumping about 280 thousand barrels of water into the reservoir. The platform will operate connected to 22 wells, 11 of them producing oil and gas and 11 for water pumping. Weighing in at 50,000 tons, its height will be 125 meters and its width 110 meters. The builders of P-51, the first semi-submersible platform built in Brazil, were hired again for constructing P-56, since the project is the same. It will allow for the production of the Marlim Sul oilfield. The construction will be carried out exclusively on Brazilian territory, including engineering, supply, construction and assembly services of the platform, in accordance with the nationalization policy defended by the Brazilian President Lula, in order to stimulate the national industry. India is getting ready to receive another 64 large sized motors from WEG. Supplying is part of the second stage of the HNSS irrigation project that will bring benefits to more than 80 million people. To solve the situation of lack of water in India, the government of the country invests in infra-structure and irrigation projects in association with the World Bank. The goal is to take water from the Krishna and Godavari rivers to irrigate lands mainly in the state of Andhra Pradesh which are, nowadays, arid. WEG is present in these projects supplying large sized Synchronous vertical motors for application in high capacity pumps for Kirloskar Brothers Limited (KBL), the largest manufacturer of hydraulic pumps in India. For the HNSS project alone, WEG has already supplied 32 high voltage motors with excitation panels and brake systems since the beginning of the project in April of 2007. Now, in the second stage of the project, WEG is getting ready to send to India until November of this year, a package similar to the first but with double the amount in equipment: 64 large sized motors also with excitation panels and brake systems which totalizes over 2,000 tons in equipment. The HNSS project, considered one of the world’s largest, will allow the irrigation of 2.5 thousand km2 of land (equivalent to 170 thousand soccer fields). More than 80 million people will be directly benefited. From the beginning of the irrigation projects in India until November of 2009, WEG intends to add up approximately 100 million dollars in invoicing with the installation of about 160 motors of 2,300 to 16,000HP all over the state territory. It’s the largest supply made to the country and one of the largest packages ever negotiated by WEG.